Got questions about surface refinishing? Miracle Method’s Surface Refinishing Guide has answers! You’ve decided it is time to bring your home out of the 1990s and into the present. As much as you’d love to do a complete remodel, you don’t have that kind of budget and will need to stretch your home improvement dollars. A friend mentions that you should consider surface refinishing as a cost-effective alternative to replacing your bathtub and countertops, but you’ve got lots of questions about the process… What does professional surface refinishing consist of? What types of surfaces can be refinished? How long does it take? How much money will refinishing save you? And how long will refinishing last? 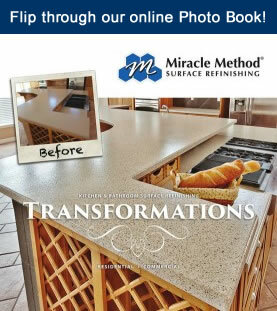 The answers to those questions, and more, can be found in Miracle Method’s Kitchen & Bath Surface Refinishing Guide. This free resource is available online, in a PDF format , in an interactive format, and in print from your local Miracle Method office. The Guide addresses most any question you can think of when it comes to refinishing surfaces such as bathtubs, countertops, showers, tile, and vanities. 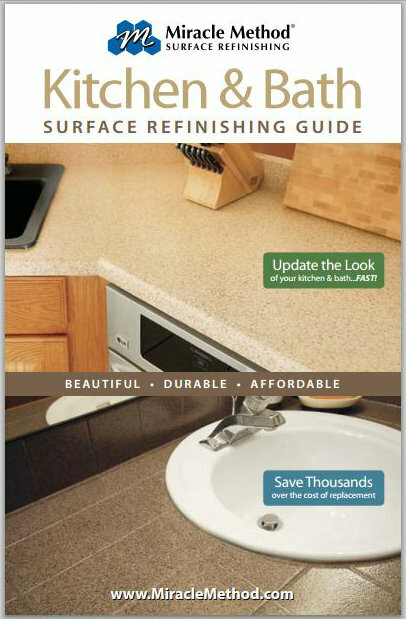 Of course, if you still have questions about surface refinishing after reading through Miracle Method’s Kitchen & Bath Surface Refinishing Guide, feel free to contact your local franchise to speak with a representative. You can find your local franchise by calling 855-212-7337 or by using our online locator. Now, let’s get those questions answered and bring your home into the 21st century! Over the past several years, there has been great emphasis in the building industry on going green and incorporating products and materials into new and existing structures that have little to no impact on the environment. While the idea of going green is still a relatively new concept to some, it is nothing new to Miracle Method. Miracle Method was green before green was popular! 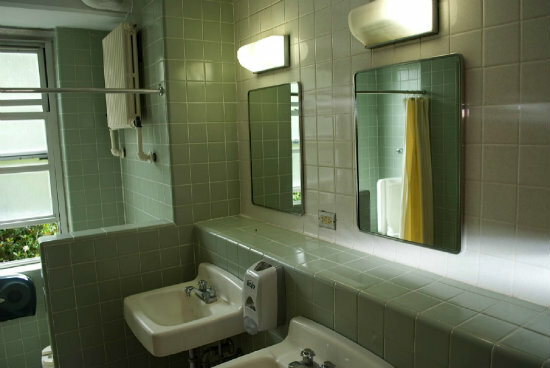 We have been “recycling” through our refinishing process for over 30 years by restoring all types of tubs, tile showers, vanities, sinks, and even kitchen countertops. 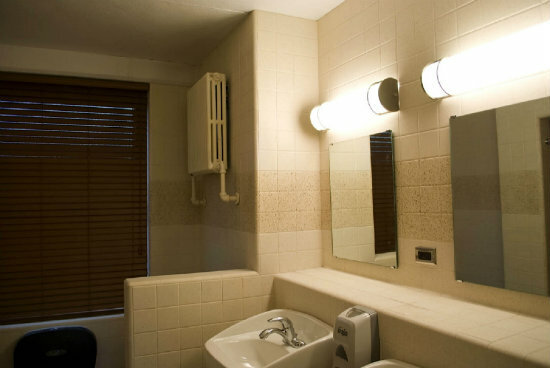 By refinishing, we can extend the useful life of most bath and kitchen fixtures by 15 years or more. This not only allows consumers to get more use out of their fixtures, but refinishing also reduces the amount of unnecessary waste that ends up in landfills. The National Association of the Remodeling Industry estimates that a typical remodeling project produces between 70 and 115 pounds of waste per square foot. With surface refinishing from Miracle Method, you can significantly decrease the amount of waste generated from your project, which also contributes to a better environment. In addition, Miracle Method avoids using toxic acids commonly used by other refinishers. 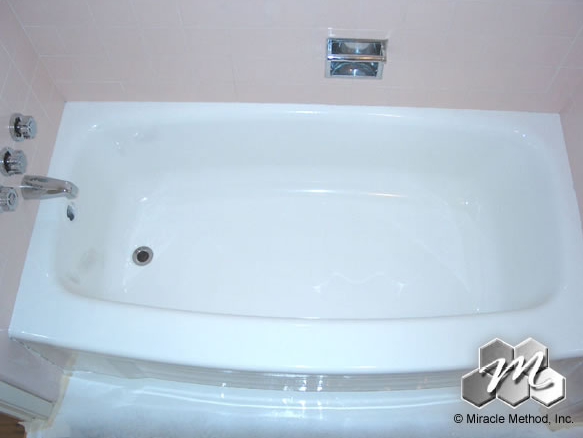 To learn more about our unique refinishing processes, please check out our website at http://www.miraclemethod.com. Go green with your remodel by refinishing instead of replacing! If you’re ready to begin a green remodel, visit the Miracle Method website to learn more about our Green Remodeling Alternative. And to find the Miracle Method franchise closest to you, visit our online locator.